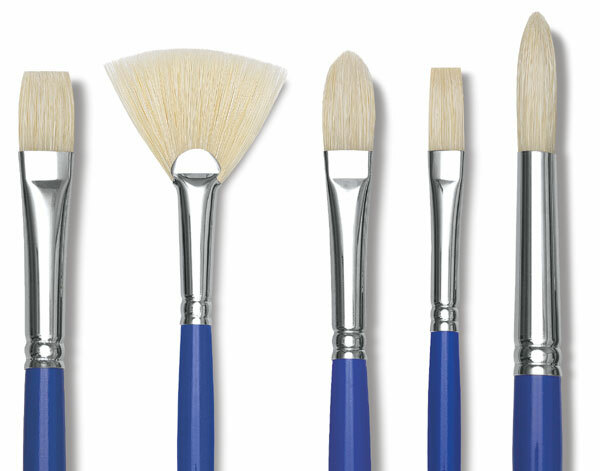 Students will love the professional feel and results these brushes deliver. The hair is 100% hog bristle — an economical, high-performance hair, ideal for spreading medium to thick paints smoothly and evenly. 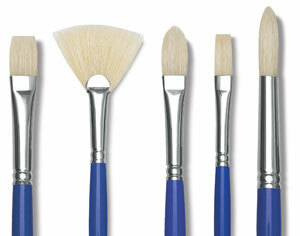 The natural wooden handles have a blue gloss finish, with seamless polished nickel-plated brass ferrules. Flat, Canister of 36 — Contains 12 each of Flat, sizes 8, 10, and 12. Assorted Shapes, Canister of 72 — Contains 12 each of Round and Flat, sizes 2, 4, and 6. Round, Canister of 36 — Contains 12 each of Round, sizes 8, 10, and 12. Assorted Shapes, Set of 6 — Contains one each of Flat, sizes 8 and 12, Round, sizes 6 and 10, and Bright, sizes 12 and 18. Set of 3 — This set includes sizes 2, 4, and 6.